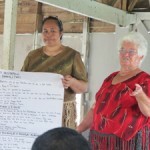 Our training on landcare has just finished in the village of Popua on the island of Tongatapu, Tonga which is showing the potential of the Australian landcare model, adapted to villages in the Pacific. 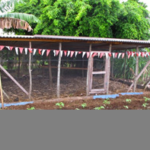 Popua has benefited from a Village Gardens project by Rotary involving the community in building 20 domestic gardens and poultry shelters in this low-lying coastal village, which is subject to periodic inundation during tropical cyclones and the associated storm surges. This project produced a high level of participation by the local community in the planning and implementation of the works even though the gardens provided private benefits to individual households. Bob Edgar, who sits on the Crawford Fund’s Victorian Committee and is with the Rotary Club of Frankston North, visited the gardens project last year and saw the potential for its further development using landcare objectives and greater community benefit to both Popua and other Tongan villages, using the strong community effort involved in the garden project with sharing of the workload and the produce. He saw that better use could be made of existing community resources e.g. the school has a significant block of land that is not subject to flooding and would be the ideal site for a community nursery/garden if the external fence was pig proof and the local community were committed to its maintenance. Tree crops could also be grown to supplement local diets as well as providing some environmental protection and enhanced landscape values. Coastal protection is an issue that could be addressed at the community level with coastal plantings of suitable species and the regeneration of the mangroves in the inlet. Mangroves as well as serving a buffer for storm surges provide nurseries for fish, which are an essential source of protein for the local population. “There is potential to extend the landcare concept to other Tongan Villages and representatives of other villages took part in the training program which covers both community development and technical skills,” said Bob. In addition to news of the training on local TV, the training was discussed on Radio Australia and is available here.